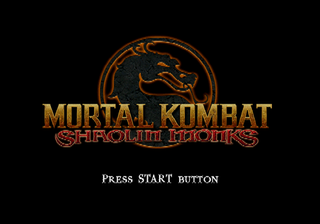 Mortal Kombat: Shaolin Monks is Mortal Kombat II as a brawler. Fun! Mortal Kombat II is said to be removed from the PAL PS2 version. More details on this, confirm Xbox. Unused characters like Goro and Null Shokan, and maybe Scorpion's rare mature-language taunts (though that isn't so much "removed" as "an Easter egg"). I've seen audio files of both lines on Total Mortal Kombat, can yank them for here. Unused areas in the Extras sub menu of the debug menu need documenting. 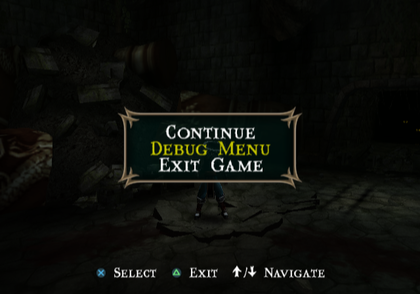 Applying the below code will replace the in game options menu with a debug menu. RELOAD LEVEL Reloads the current level. MAP SELECT Opens a map select menu. SAVE MENU Opens the save menu. GOD MODE ON Refills your health when toggled on. 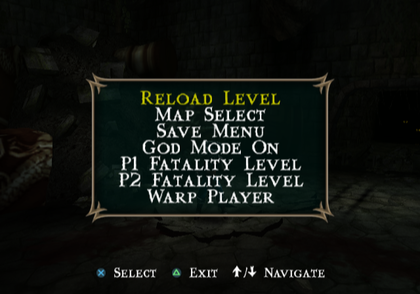 P1 FATALITY LEVEL Sets player one's fatality level. 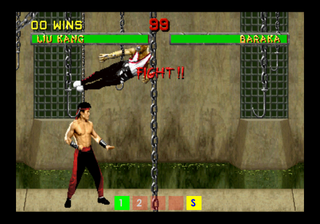 P2 FATALITY LEVEL Sets player two's fatality level. WARP PLAYER Warps you to various points in a map. This allows you to warp to various maps on demand. 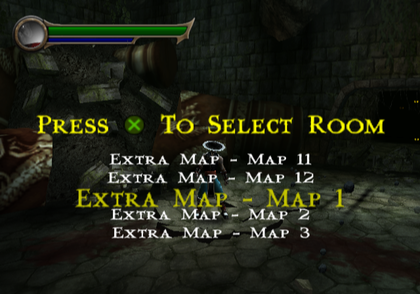 The EXTRA category contains several test maps. The first extra map will crash the game when selected. Survival Mode is something that was apparently not finished and was removed from the main menu and normal accessibility. Because this is Mortal Kombat and nothing can ever be that simple, some wag hid a hidden means of accessing it in the game. It takes a lot of work, but it's there! Grab the Axe (the one you follow while it is being made). Go into the room with the lava (you must break the wooden door to enter this area; this is in the hallway where two arrow guards bust through the walls, there is a part of the wall on the left side you can break by throwing an enemy through). Jump into the lava, then jump back out. Go into the hall to the right of the save statue and smash the barrel at the end of the hall using Circle (PS2) or B (Xbox). Go up the ramp, and take two lefts and smash only the barrel on the right. Go to the area with the kama (the small cubby to the right/straight of the top of the ramp) and smash the barrel on the right. Go to the area with the stones that drop from the ceiling and smash this barrel (it is left of the cubby). Go back to the area with the kama and smash the left barrel. Go back to the left of the top of the ramp and smash the left barrel using Circle (PS2) or B (Xbox). Hold Circle (PS2) or B (Xbox) to smash the ground. You should see a green glowing area behind where the barrels were if you did everything correctly. Step into the glowing area and press R2 (PS2) or BLACK (Xbox) to enter Survival Mode. The characters aren't quite unused playable choices so much as they are they have button assignments to them and they're all the same. Unfortunately, many of them can cause the game to crash. Using a cheat device can not only allow you to play as mooks and bosses but even discover unused enemies though for reasons unknown, a few of these characters have a strange neon glossy texture placed on them when used. The characters actually do work in cutscenes so you can play with one in Co-Op, though because their models (especially the females) don't match the animation skeletons of the normally playable characters, they'll look very warped. Also, if you save using one of these characters, that save file will treat it as any other normally-playable character, meaning when you load the file again, you'll resume play as them regardless of whether you're using a cheat device. You can remedy this by switching the character mod to the normally playable characters and then save again using that character. You'll be required to since you will need to at two points in the game perform a Fatality and a Mutality. Pressing a shoulder button in conjunction with a face button or two will allow you to use their special attacks, and they consume the Stamina Gauge like normal. It's also possible to play as characters who don't have any attacks at all. If you stop after a run, the model will briefly spasm as they have no animation for skidding to a stop. Boss Reptile: Requires a joker command. Ermac: This is a strange case. Whenever you use a cheat device to access Ermac, you instead use a lower-res model than the one you fight with slightly different textures and has no attacks. A joker code is required to use the right model. All of his moves are available except for one (the forcefield) which doesn't appear to be mapped to any button combination. Inferno Scorpion: Works. His area flame attack only work in the Netherrealm. Shao Kahn: Also requires a joker. Old Shang Tsung: Similar to Smoke. Young Shang Tsung: Works. Using the Morph ability will simply render Shang Tsung invisible, and he will not turn into anyone else. Skull: Works, but has no glow and does not disappear after connecting a hit. Brotherhood of the Shadow: Chance of crashing. Has a strange bright green texture over him. Bloody Skeleton/Putrid/Undead Corpse: Using the self-destruct causes you to fall through the level. NULL 1: A large demon with distorted animations but working attacks that include fire breathing and lobbing arching fireballs. May have been a prototype for the Orochi Hellbeast. NULL 2: Working unused Oni-like demon similar to the large boss fought at the Pit Bottom. Has distorted animations, but attacks work. NULL (Nagiri Swamp): Working unused naga enemy that attacks with a bow and arrows as well as her tail. NULL (Green Tarkata): Similar to the Tarkata enemy but has green-colored blades. NULL (Shokan): Working unused enemy that might have been used as a normal enemy. It has a hunched-over appearance and has a grab attack similar to Goro. Figure out how to access it. 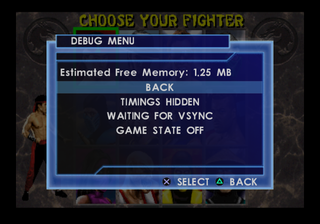 Present at 0x474A30 in SLUS_210.87 (PS2 US) is some text for a debug menu. 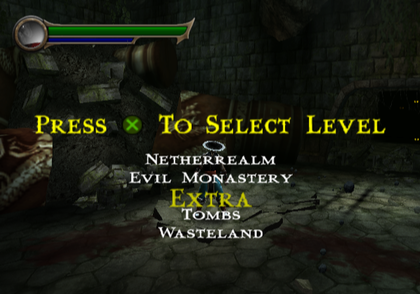 The first option goes back to the game, the second option toggles v-sync, and the third option displays some player status icons at the bottom of the screen. This page was last modified on 29 May 2018, at 06:39.